Oliveti Cubicles range of vanity units and vanity shelves introduce inspiration into any washroom environment, our comprehensive range of stylish yet functional vanities and accessories will provide the solution to your vanity needs. As bespoke manufacturers we make all of our products to the exact required sizes even if this means carrying out surveys ourselves. This is all a part of our service and ensures we minimise required alterations. With style and modern design, our range includes many designs and we also offer a bespoke service. Our vanity units are part of our washroom system and can be matched with cubicles. Our range of accessories including mirrors, lights, soap dispensers, towel dispensers, storage cabinets and bins froma wide range of manufacturers, enables you to maximise the space in the washroom area and provides an alternative to more traditional solutions. Our selection gurantees that we can offer a truly creative solution from the most functional to the most prestigious commercial washroom environment. There are various configurations and bed heights available to suit counter top and semi recessed wash hand basins. 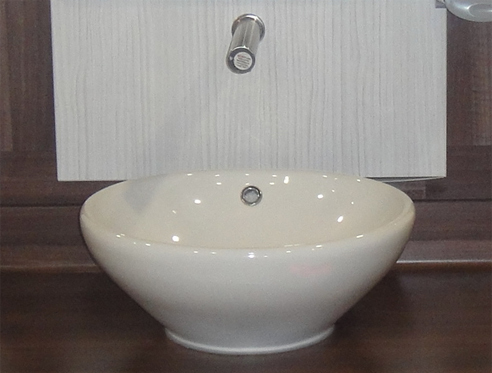 Length – Vanity units are available in various lengths to suit any number of wash hand basins. Generally we allow a minimum distance of at least 150mm between wash hand basins, however 200 to 250mm is preferred. Height – Standard adult height is 800mm FFL to counter top. 700mm for junior and 600mm for infants. Width – Standard width is 600mm for adult K4 profile ‘inset or counter top vanity units’ and 350mm for K2 ‘semi-recessed’ vanity units. Clients may specify alternative dimensions to suit their specific needs.